Kaminagano Wintesweets(上永野蝋梅の里), Robaino sato in Japanese is one of the largest Robai Forest located in Kanuma, Tochigi Prefecture. There are 4 different kinds about 600 Robai, Wintersweets. Robai blooms from the end of Nov. to March. It has the beautiful yellow flowers and nice smell. Robai means a candle plum because their petals are looks like it. Season: From the end of Dec. to the middle of Mar. You need a car. Get off at Tochigi Inter of Tohoku Expressway. Robai no Sato is one of the largest Wintersweets forest located in Kanuma city, Tochigi Prefecture. 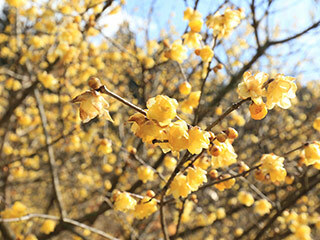 It is a 13.000 square meters wintersweet garden with over 4 different kinds 600 wintersweets trees. Because there are 4 different kinds, this forest has wintersweets from December to March. Bloom from Nov. to March. It has circular petals and deep yellow color. Bloom in Jan. to March. It has a purple color in the center. Only available to see it in this garden. Bloom in Feb. to March.It has thinner petals and dark red in the center.